The shutout, Oettinger’s fourth of the year, ties the BU career mark of thirteen. He shares the record with former BU All-Americans and Hall of Famers Jack Ferreira and John Curry. 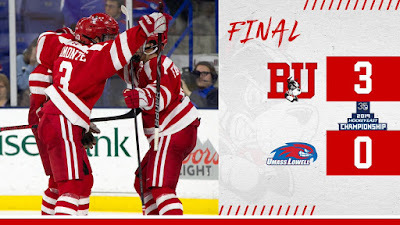 After a scoreless opening period, BU took a lead early in the second that it would never relinquish when Joel Farabee redirected a Dante Fabbro shot for his 14th goal. Kasper Kotkansalo also assisted. Four minutes lates, Patrick Harper had a near breakaway, but his shot was turned aside by UML’s Chris Hernberg. Late in the period, the Terriers doubled the lead on their only power play opportunity of the game. David Farrance skated up the left side, cut towards the net drawing two defenders to him and put a perfect pass on the stick of Cam Crotty who had a yawning half-empty net for his third goal of the season and second against the River Hawks. Ty Amonte had the secondary assist. Trying to cut into the BU lead, Lowell mounted pressure in the third period, but were able to put only four shots on the Terrier net. BU killed the River Hawks only power play opportunity in the opening minutes of the period. Amonte nearly added a third goal six and a half minutes into the period, but was stoned by Hernberg on a breakaway. With seven minutes remaining, Oettinger turned away Colin O’Neill’s point-blank shot, which was UML’s best opportunity of the period. With Hernberg pulled in the final minutes, Farabee set up Patrick Curry for an empty-netter, his 12th tally of the season, with Shane Bowers also assisting. BU helped Oettinger keep his net empty with ten blocks. Bobo Carpenter was held off the score sheet, but had a dominant night in the faceoff circle, winning 13 of 16 draws. BU was the only road team in the conference to win on Friday night with the three other quarterfinal games going to overtime. A win tonight or Sunday would send the Terriers to the conference semifinals for the 15th time in the past 18 seasons. 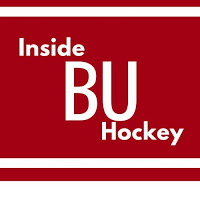 ►This week’s episode of Inside BU Hockey features Bernie Corbett’s interviews with Head Coach Albie O’Connell and senior co-captain Bobo Carpenter, who looks back on his career as a Terrier. 2019 recruit Robert Mastrosimone scored a pair of goals in Chicago’s 4-3 loss to Youngstown. With five goals and four assists in his last five games, he now has 50 points for the Steel. 2019 recruit Trevor Zegras scored a goal and added an assist in the NTDP U18s’ 12-4 drubbing of Green Bay. Alex Vlasic also added a helper. Zegras’ assist came on the fifth of six goals scored by Cole Caulfield. 2020 recruit Liam Connors has been named a tri-captain for the 2019-20 St. Sebastian’s Arrows. Connors had a career best 43 points (14G, 29A) this season. 2019 recruit Liam Gorman, a co-captain on this year’s Arrows, had 38 points (16G, 22A). Thanks to a blog reader who sent along a link to a USPHL.com report on 2019 recruit Jamie Armstrong, a forward on the Junior Bruins.